Korean Air has launched non-stop flights between Boston and Seoul. The first flight, operated as part of a joint venture with Delta Air Lines, was saluted by a water cannon on arrival and celebrated in speeches by airline and government officials. 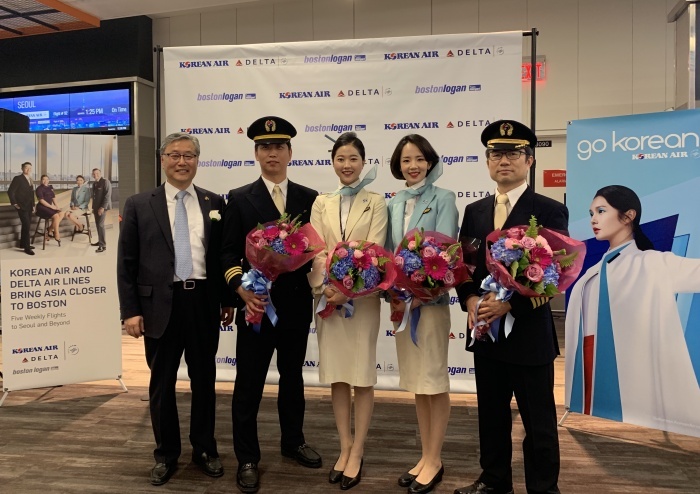 “Korean Air is the largest trans-Pacific airline and we’ve been eyeing Boston for a long time,” said the Korean Air vice president of marketing, John Jackson. “It makes sense, with our Delta joint venture, to start service there now. “As a major gateway for high tech industries, Boston is the most popular unserved point from Korea with rapidly growing demand to Asia,” Jackson added. The new Boston flight, along with the Minneapolis/St. Paul-Seoul and Seattle-Osaka services that Delta is launching, are the first additions to the joint venture’s trans-Pacific network since the two carriers launched their partnership last May. “By combining the schedules of Delta and Korean Air, our customers are able to enjoy unparalleled travel options,” Jackson said. The Boston-Seoul service will operate five days a week on Korean Air’s new 787-9 Dreamliner aircraft. ← This Week in Weed: DO NOT SMOKE THIS!